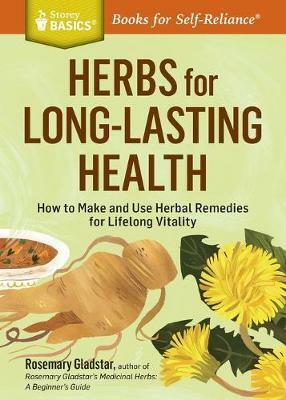 Rosemary Gladstar shows you how to enhance your well-being in middle age and beyond using herbal remedies that effectively and safely promote vitality. With in-depth profiles of 22 medicinal herbs, preparation instructions, and dosage guidelines, you'll discover how you can use astragalus to regenerate your body's immune system, bilberry to ease eye problems, and milk thistle to rebuild damaged liver cells. You'll be amazed at how herbal treatments can help support your nervous system, activate your metabolism, and keep your bones and joints healthy. Enhance your well-being with 22 herbs that promote vitality, longevity, and general well-being. Best-selling author and respected herbalist Rosemary Gladstar describes the benefits of each herb and its contributions to supporting a healthy lifestyle. In addition to general preparation tips for the herbs, you'll find 15 recipes for tinctures, teas, tonics, and more, including Longevity Tonic, 7-Herb Long-Life Soup, and Brain Tonic Tincture.